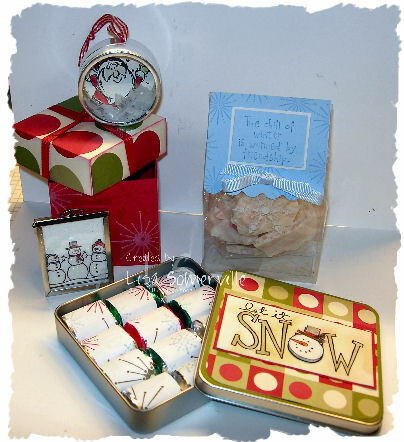 The box is for the two ornaments you see pictured - one is made from a round tin, the other from a photo holder. The gift bag is a 2/5/7/10 box, but I made mine out of acetate and gave it a card stock flap. Inside I made homemade Peppermint Bark (Almond Bark, melted and mixed with crushed candy canes), which is sealed in a SU clear envelope. The tin can be found at your local Kohls store (gift card tin), it will hold 9 Hershey nuggets nicely. I used the Snow Burst Stamp set and stamped my images on Avery Address labels, and wrapped them around the nuggets. The sentiment on the tin is SU's Big on Christmas, I used the Marker Wash Technique from the October TJNL, then finished decorating my tin with Dashing DSP. Hope my gift exchange partner likes her gift! very nice ideas! Love that acetate box idea! It shows off your yummy-looking home made candy! TFS such wonderful ideas! Who wouldn't love to receive any of these as a gift box?? They are all wonderful. The peppermint bark sounds delicious! Can you please send me some of your talent and creativity?